Kenya: KQ Gears Up for October Direct Flights to the U.S.
America's Transportation Security Administration (TSA) agency has concluded a security audit of Nairobi's Jomo Kenyatta International Airport, paving the way for issuance of the Last Point of Departure (LPD) permit "in the next few weeks," four months ahead of the commencement of direct flights by Kenya Airways to New York. KQ chief executive officer Sebastian Mikosz told The EastAfrican that the agency gave Kenya a good assessment as preparations in both Nairobi and US intensify in the run-up to the inaugural October 28 flight. "The TSA gave a good assessment and this is very important for us because the LPD is one of the last steps of the preparations," Mr Mikosz said. The TSA requires security measures for passengers enhanced at all LPD airports to the US, to thwart any threat from terrorists, who target commercial aviation. According to the TSA, this robust system employs multiple layers of security, including thorough screening at checkpoints, heightened screening of personal electronic devices, increased security protocols around aircraft and passenger areas and deploying advanced technology, expanding canine screening, and establishing additional preclearance locations. Mr Mikosz said that KQ has established a general sales agent in New York and has both country and station managers to market the business and boost ticket sales. "In three weeks, I will be in New York for meetings and promotions," said Mr Mikosz, who took over the airline's management one year ago. He said bookings for the non-stop flights are proceeding well but he expects the bulk of the bookings to be made in the final weeks. 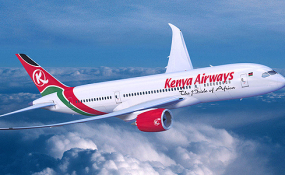 Kenya has been seeking direct flights to the US for over a decade but JKIA's longstanding second-class designation -- before it was awarded the Category One status in 2017 -- forced passengers to transit through Europe, the Middle East or the four African states -- South Africa, Ethiopia, Cape Verde, and Nigeria -- whose airports have the designation. The daily trans-Atlantic flights will depart Jomo Kenyatta International Airport at 10:30pm and land at the John F. Kennedy International Airport after 15 hours, cutting flight time between the two cities by at least seven hours. KQ will deploy two dreamliners on the flights which it will operate through a code-share partnership with US carrier Delta Airlines, with each trip carrying a maximum 234 passengers -- 204 in Economy and the rest in Business Class. Business class travellers will pay $2,576 for a return ticket while economy class flyers part with $890. Although US Department of Transportation's permit to KQ to fly directly to the US includes passenger, mail and cargo, the flight's freight capacity especially from Nairobi will be more limited and priority given to passengers and their luggage. "We will have greater cargo capacity once we begin operating and observe how the plane behaves over three months. From New York to Nairobi we have no restrictions as it is at sea level, unlike Nairobi which is elevate, making the air less dense, so we cannot carry much weight," Mr Mikosz said. The US remains a key source of tourists to Kenya with data from the Kenya Tourism Board indicating that the number of US tourists visiting Kenya between January and October 2017 stood at 95,771, 16 per cent up from the 82,363 recorded in the same period in 2016. The preparations for the launch of the direct flights to the US comes even as the airline celebrated the commencement of two other direct flights to Mauritius and Cape Town earlier this month. It has more than a year since you joined KQ. How have you fared? It has been a very intense and interesting period. I have been studying the challenges that we face as a company, not only from the restructuring perspective and but also the industrial part of it. When I came in, the restructuring plan, which was started about three years ago, was already in motion, and I have been focusing all my energies on strengthening that plan. We continue to launch new routes and strengthen our main markets, but other challenges that are beyond our control such as fuel prices, which represent 25 per cent of our costs -- which have risen from $52 per barrel when I joined to $74 today -- remain. I would love KQ to be profitable on all levels, but this is a goal we have to gradually attain. The airline has been working along a restructuring that involves at least 11 local banks. How has this gone? The restructuring has given KQ a new lease of life. We are currently in post-discussions and implementing it. Both the lenders and the shareholders believe that we will improve and they have all. The board of directors has been very supportive. What is the airline's outlook and expansion plan for 2018? We are looking to stabilise and starting new routes to flip the pages and focus on growth. We have just announced three new destinations and will announce several new routes to Europe, Africa and Asia, which remain our top targets by the in the next three months. We are also bringing back five subleased aircraft -- two Boeing 787-8s from Oman Air and three 777-300ERs from Turkish Airlines -- for use in the next two years as we continue the restructuring and focus on the five-year plan that we submitted to the board. This gives us a direction of where we want to be -- among other things, to be profitable as fast as possible. African countries, including Kenya, signed the Single African Air Transport Market. How will this market work for KQ? Kenya signed the treaty that is already largely implemented, because we have at least 26 operators already flying to Nairobi, compared to only five that fly to Addis Ababa. I think, however, that the agreement will not be fair if all the member airlines are not financed the same way and do not face the same constraints. This is because companies which are fully government-owned and have a different legal framework will always compete better. The agreement, however, is akin to applying private rules including a financial mandate but still be expected to realise profits. The open skies plan in Europe, for instance, has harmonised all the rules that the airlines play by. Any financial support from the state to its airline will have to go through an approval process by the European Union. Rwanda, Tanzania, Uganda and Ethiopia are implementing serious expansion plans. How will KQ survive the competition? We are not in a frozen market situation because the size of the market is growing. Again from my experience in Europe, airlines will always grow and the more players come up, the end result is that they stimulate the market. Tanzania, Uganda and Rwanda will be the new competition, but I think it will take longer before they establish connections to London, Paris and other Asian markets. But, as they grow, we are also determined to growing Kenya Airways. If they have 20 aircraft, we should have 45, if they reach 25, we should strive to have 60. What does the proposed KQ-Kenya Airports Authority merger entail? Has this model worked anywhere else, and how will it affect the airline's operations and those of the other airlines? The government's strategy on this is to use the public-private partnership model, which is a well-defined framework under the law. RwandAir, Turkish, Qatar, Emirates, Ethiopian, Oman and others, are all at advanced stages of implementing this model. Although they are not listed, they are fully state-owned and control all the assets, including their home airports, allows them to grow much faster. I believe in the model where a country puts in all the national assets to attract maximum synergies from airlines instead pitting them against each other, which supports the competition.